Stunning Smoky Mountain Views ~ Close to Town with Easy Access by Car! Flexible for both couples and families, Picture Perfect has something for everyone! Tucked away in the mountains, you’ll find this log cabin has all of the modern conveniences of home and more. It's grand two and half stories has high ceilings and features full length windows with a breathtaking panoramic view of the Smoky Mountains. Picture Perfect is furnished with Colorado style furniture, which you will find to be both inviting and comfortable. The cabin showcases the lovely wooden log staircase and amazing sleeping loft on the top floor, with two queen beds that are accessed by a log ladder. The sleeping loft is an all time favorite of both the children that stay there, and the young at heart too. The main floors of the cabin have nice open areas with the kitchen, dining, and living room on the first floor, along with a bedroom that accommodates a king bed and it's own bath. The second floor boasts the larger of the two bedrooms and its own master bath, along with a wide open game room ready for some friendly competition and fun! If you like entertainment, you will find a little something to do all anywhere in the cabin – Wii and Wii games, movies, pool table, wireless internet, hot tub, cable TV, games, cards, and books. You'll even find a yard for the little ones to play in, which is rare in the mountains. Take time to relax in one of the many rocking chairs located on three covered porches so you can enjoy those fantastic views, or you may want to try a long soak in the hot tub or sit by the fireplace and enjoy a little downtime. No matter how you spend your time at Picture Perfect, you will have the best of both worlds and can be in town in just minutes. That is where you will find restaurants, shopping, and every kind of entertainment you can imagine when you're ready to venture out. It's only 3.5 miles to the parkway! Come to the Smokies and have a great stay! We have always enjoyed the spectacular beauty of the Smoky Mountains. It is such an amazing area that we decided to purchase a log cabin so we can enjoy all the area has to offer. We hope you have an wonderful stay in the Smokies too! 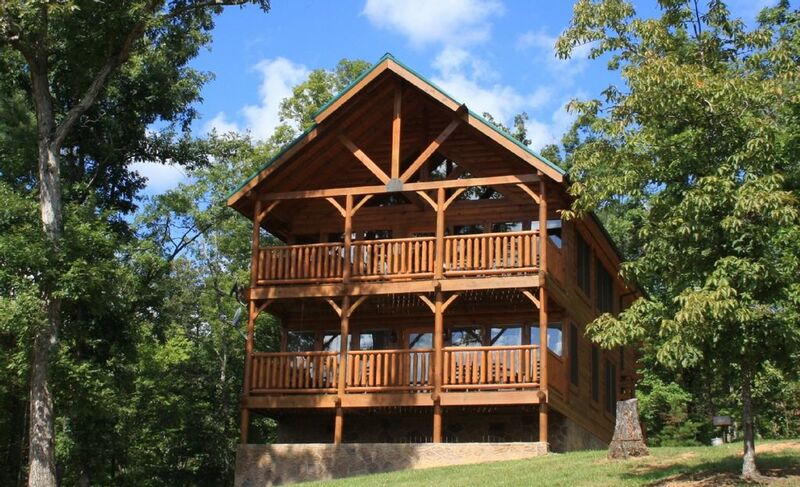 We chose this cabin due to it's great location, view and layout. It is just a few miles from the parkway, and is less 10 minutes to the parkway where you will find all the action, yet still far enough away to get away from it all. It is truly the best of both worlds! The Pigeon Forge Recreation Center is just a few minutes away. It features both indoor and outdoor pools. They also have full work out facilities and a bowling alley that is accessible to guests for a nominal fee. We really enjoyed our stay and would recommend staying here. What a fantastic property! Often pictures give a unrealistic impression of a place, but that was not the case with this cabin. The cabin was wonderful, very clean and more spacious than we could have imagined. Tucked away in the timber with breathtaking views, we enjoyed every minute of our stay. Close drive to everything, yet out of the hustle and bustle of the tourist traps. I could go on and on. I highly recommend this beautiful home. Owners are a pleasure to communicate with as well. Beautiful location. The cabin was well maintained. Great place for a family vacation. Great place to stay in the mountains! It was easy to get to the area attractions. The cabin is well maintained. The view was beautiful. Highly recommend. The stay here was so amazing! From the view on the back porch to sitting in the hot tub, this cabin had everything to offer for my friends and I for our spring break trip. Overall very nice, would have given 5 stars if it had a real fireplace ( wood or gas) The electric fireplace was a little disappointing, but other than that was great! I'm glad to hear that you enjoyed the cabin and had a nice stay! The fireplace is noted in the listing that it is electric, so I'm sorry to hear you were disappointed with that aspect of your stay. The cabin did not disappoint. Everything was as described and pictured. The cabin is large, clean, comfortable and conveniently located. We enjoyed the hot tub, pool table electric fireplace. The best part is the view. From both levels you get constant reminders of the mountains and surrounding forest. A couple deer strolled by the first evening. With the sun out for most of the week we just loved soaking in the view of the mountains above us. We will definitely consider another stay. The true natural beauty of the Smoky Mountain region is unsurpassed. There is so much to see and do in the general area where Picture Perfect is located! Head down to the Smoky Mountain National Park where you can hike, fish, view wildlife, horseback ride, and more. If you're looking for shopping, take in the areas of Pigeon Forge and Gatlinburg. You'll find both quaint shops and great outlet mall shopping. You'll find some very unique entertainment experiences in Pigeon Forge, like WonderWorks and Zorb. If you like aquariums, head down to Gatlinburg for an amazing underwater adventure. If arts and crafts are more to your liking, tour the arts & crafts community outside of Gatlinburg. It is truly a one of a kind experience. You'll find many local artisans and their unique works of art for sale. Lastly, don't forget about visiting Dollywood and the waterpark. With rides and entertainment, you'll surely have a fun filled day! *** No smoking, no pets, no singles under the age of 25. *** Additional fees ~ $100 cleaning fee and 12.75% tax *** Check in is at 4:00 P.M. and check out is at 11:00 A.M.